The BlueJay, is an amp that got its name not from its feathered friend by the same name but rather from the fact that it can be a great companion for Blues and Jazz. Its warm clean tones are reminiscent of the classic amps that came out of California all those years ago. It can do more than clean though, it can also deliver rich overdrive tones that make you want to play those pentatonic licks all day long. The amp operates with a single 12AX7 tube in the preamp and uses a solid state power amp. The FX loop enables you to put your time based effects (or Phasers, Flangers and Choruses) behind the drive section and keep the effects sharp and not prevent them from being too muddy. Includes 2 Cables and a Geartree Cloth! 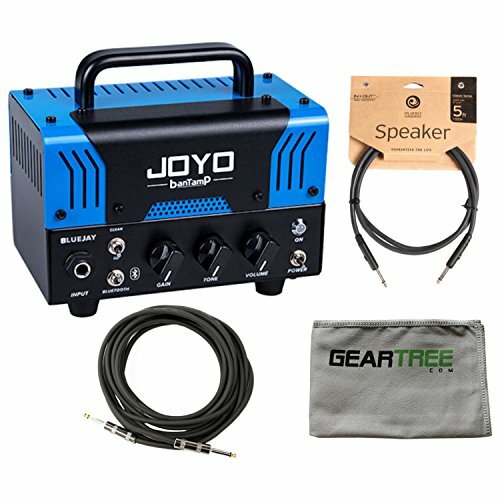 The BlueJay from Joyo's BantamP series is a very compact and portable 20 Watt head. Careful, the amp is small, but loud... its 20 Watts can be quite a handful. If you want to practice quietly, use the built in headphone out with speaker emulation.